I was happy to see Eric Shinseki's statement today. (below) I know many people are disappointed with how slow President Obama has been on many of our core issues. AND I know we've had horrible news on the anti war front and on women's issues. BUT One thing for sure is that this administration has taken seriously the needs of our vets and has done a tremendous amount for them. So as the wife of a vet it burns me up to hear all the stupid lies about how the health care bill will reduce tricare benefits etc. It is just not true, And the Secretary for Veterans Affairs, whom I greatly admire, has come out swinging against the latest crap that is being spun out there. This is esp. important as the tri care lie has been making it's way through many vet networks that my husband and I are a part of. 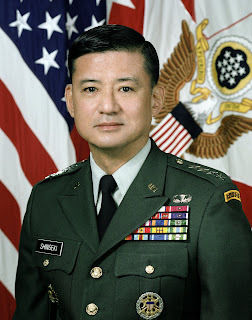 But the vets really admire Shinseki so this should help A LOT. WASHINGTON - As Secretary of Veterans Affairs, I accepted the solemn responsibility to uphold our sacred trust with our nation’s Veterans. Fears that Veterans health care and TRICARE will be undermined by the health reform legislation are unfounded. I am confident that the legislation being voted on today will provide the protections afforded our nation’s Veterans and the health care they have earned through their service. The President and I stand firm in our commitment to those who serve and have served in our armed forces. We pledge to continue to provide the men and women in uniform and our Veterans the high quality health care they have earned. President Obama has strongly supported Veterans and their needs, specifically health care needs, on every major issue for these past 14 months – advance appropriations, new GI Bill implementation, new Agent Orange presumptions for three additional diseases, new Gulf War Illness presumptions for nine additional diseases, and a 16% budget increase in 2010 for the Department of Veterans Affairs, that is the largest in over 30 years, and which has been followed by a 2011 VA budget request that increases that record budget by an additional 7.6%. To give our Veterans further assurance that health reform legislation will not affect their health care systems, the Chairmen of five House committees, including Veterans Affairs Chairman Bob Filner and Armed Services Chairman Ike Skelton, have just issued a joint letter reaffirming that the health reform legislation as written would protect those receiving care through all TRICARE and Department of Veterans Affairs programs.